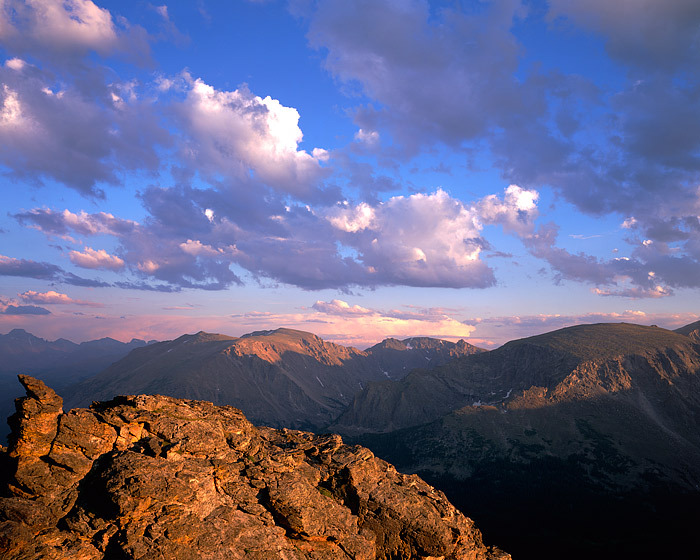 Rocky Mountain National Park's alpine tundra unfolds in this view from high atop Forest Canyon. At nearly 12,000 feet above sea level, it almost appears as if one can reach out and touch the clouds gliding overhead. The clouds are a result of Colorado's summer monsoon season but this afternoon have dispersed before becoming acutal rain storms. Rocky Mountain National Park's Trail Ridge Road provides great views of Rocky's tundra and pristine mountain scenery. Photo © copyright by Thomas Mangan.